You know you are having a hard time separating life from work when you are viewing x-rays of your own horse and all you can think about is what a great reference that would be for a new illustration project. 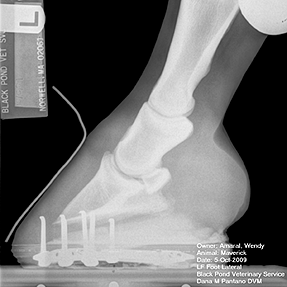 One of my horses had an extended battle with hoof problems and this x-ray is one of many taken during the years we struggled to get him sound. I decided to use it as a reference for the normal anatomy of the lower limb and hoof in the veterinary illustration generated in Adobe Photoshop of a limb perfusion procedure. This struck me as kind of funny, since the anatomy of his front legs is anything but normal, he has a clubby right front hoof and the complete opposite problem in the left front hoof with an underrun heel. If the horseshoe in the image looks unusual, you are very observant. That is a special composite shoe designed by EponaShoe in California which makes these flexible polyurethane horseshoes to treat various hoof disorders. While they weren’t a great permanent shoeing solution for my horse (due to our very wet climate) they did provide him with a transition step from metal horseshoes to eventually going barefoot. After years of trying various things to improve the situation, with varying degrees of success and failure, I finally pulled his shoes, found a barefoot trimmer, and let nature take it’s course. It was perhaps the best decision I could have made for him, as his hooves improved and he no longer has the problems he struggled with for so many years. His confirmation is what it is, and instead of fighting against it, simply letting it be and working with it was the best course of action. The horse will never be completely sound, but he has a great quality of life and as long as his attitude and personality are good, he will be a semi-retired paddock potato whose toughest job is holding still for the occasional reference photo.